Electronic Arts has announced that a demo for Dante's Inferno will be released in December, giving players a chance to experience the game's entire opening level. The Gates of Hell demo will introduce the game's hero, story and "fast paced hack-n-slash combat" as players begin their epic journey by squaring off against Death itself before opening the gates of Hell and descending into the Stygian abyss. The demo will also include two "stunning" cinematic sequences created by Blur, which has previously developed trailers for games like Warhammer Online, Star Wars: The Old Republic and Dragon Age: Origins. "Our main goal from the start of this project has been to create a journey that will make gamers truly feel like they are going through hell," said Jonathan Knight, executive producer at Visceral Games. "The demo will give everyone some insight into how we are treating the story and a taste of the gameplay. And with nine more circles of hell to explore once the game comes out in February, we are literally just scratching the surface." 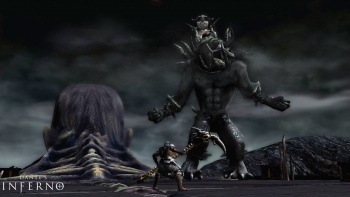 The Dante's Inferno demo will be released in December, while the full game is scheduled to come out on February 9 in North America and February 12 in Europe for the Xbox 360, PlayStation 3 and PSP.